Last weekend I visited Columbus, Ohio for the first time. As many know, Columbus was the recent winner of the U.S. Department of Transportation’s (U.S. DOT) Smart City Challenge competition and will receive $40 million to implement smart technologies to enhance its transportation system. While there is a lot of buzz about Columbus and the impact the Smart City Challenge will have on the community, I visited with my planner’s hat on to see first-hand why Columbus was selected and how smart city technology could help this sprawled, midwest city. I was surprised to see updated bicycle and transit facilities already in place. CoGo, Columbus’ bikeshare system was everywhere (per CoGo’s website 46 stations and 365 bikes to be exact). I was interested to learn that the city’s bike share has been around since the summer of 2013, that is before a lot of other U.S. cities adopted bike share programs. I even saw a few innovative bike racks around town and on the Ohio State University campus. I noticed the one pictured to the right while driving downtown. 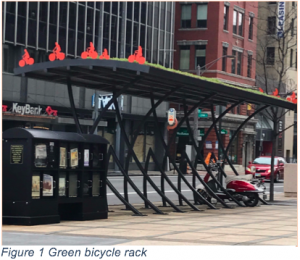 It shows how a simple bicycle rack can be used as public art space as well as promote sustainability with the installation of a green roof. I was also excited to see construction beginning on Columbus’ first-ever bus rapid transit line and it was incorporating smart city technology. The picture to the left shows the new CMAX (the name of the BRT line) kiosks, which include screens to provide real-time transit information. Additionally, behind the bus in the photo, new shelters were built for more comfortable waiting. CMAX is an exciting transit opportunity for the city and will connect downtown to Polaris Parkway/Africa Road along the Cleveland Avenue corridor. This route will provide important connections to job centers as well as access to healthcare and education resources. 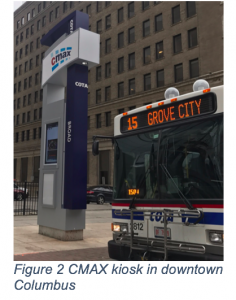 The Central Ohio Transit Authority (COTA) is currently installing these kiosks along the CMAX route and the line is expected to open for testing in December 2017. Columbus has a strong sense of neighborhood, or as the city would refer to them “area commissions”, which are technically larger than neighborhoods. While I know in two days I was not able to see all the different Columbus neighborhoods, I was surprised to see the deep sense of history and variety in the neighborhoods I did visit. When driving and walking around the different neighborhoods in Columbus, I noticed the preservation of cobblestone roads, brick sidewalks and historic buildings. I was impressed to see so much effort going into historic rehabilitation, in a city that is now touted for its forward, technology-oriented thinking. It will be interesting to see how the city will use technology innovation to further its preservation efforts and maintain those neighborhoods’ historic character. When I asked how long it would to take to get somewhere, my brother, who has lived in Columbus for two and a half years now, kept repeating, “Everything is only a 10-15 minute drive away.” And that was largely true. Even on a Friday at 6:00 PM from the airport to our hotel, it took 15 minutes to drive about 12 miles. Coming from Los Angeles, just getting out of the LAX parking lot can take 15 minutes. Although there is little congestion on the roads now, there are signs of growth that may push the capacity of Columbus’ transportation system. In 2015, Columbus metropolitan area population grew to over 2 million, during a time when population in Cleveland fell and put Columbus on pace to surpass Cincinnati as Ohio’s largest city. It was obvious when walking around downtown and the popular Short North area that construction was booming. Open lots were being cleared and cranes were overhead. With Columbus growing as a tourism and residential destination, winning the Smart City Challenge will not only help Columbus’ current transportation problems, but also help Columbus adapt into the future. The solutions being implemented in Columbus will help other cities experiencing growth and connectivity issues.